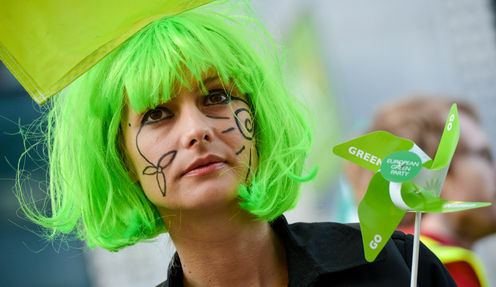 Could worldwide climate protests make a difference? It is set to be one of the largest ever co-ordinated protests. The People’s Climate March is due to take place in cities all over the world this weekend to try and influence the UN climate summit that follows on September 23. The marches promise to be a major global event, billed by organisers as an “unprecedented mobilisation”. No doubt it will be enjoyable to take part in – but that’s no guarantee it will work. The anti-war protests in 2003 mobilised somewhere between 6m and 10m people across 60 countries but famously failed to prevent an attack on Iraq. There is of course a substantial risk that a climate change march will similarly have no immediate discernible effect on climate policy. On the other hand, the 2003 anti-war demos may still be affecting debates about the use of force and security and ongoing efforts to take account of opinion. Popular protests have of course toppled governments and even political systems before. And sometimes it takes years or even decades to recognise what protests and revolutions really meant, including wider changes in values and priorities. So it is not that simple. A better question is: when does protest work, and when not? Firstly, even if marches come and go without immediate effect, one review ventures that public opinion matters to policy-making “roughly three quarters of the times”, especially by making issues “salient”. If protests actually affect public opinion then they can work indirectly. Obviously mobilisation is then required: you have to be in it to win it. Among political sociologists “resource mobilisation theory” emphasises the importance of the ability to mobilise support and marshal resources effectively. Be big and beautiful as a movement. At the same time, tightly co-ordinated action has been linked to success, and efficient organisations therefore seem also to be a key factor. Other research indicates that mobilisation is not enough and organisations don’t matter much. A rival theory focused on “political opportunity structures” says that mobilisation happens all the time – what matters is contextual factors and whether the system is ready. In particular, there have to be strong allies on the inside to convert pressure from the outside into policy change. These days media framings of protest appear also to be important, but they are rarely kind to direct action protests. Inevitably, timing also matters. A crisis moment can be a perfect moment to break down institutional barriers – although it may also make the system close ranks. In sum: luck is when preparation meets opportunity, as Roman philosopher Seneca reputedly said (long before sociologists reached a similar conclusion). To maximise chances of success, climate change marchers will need a lot of factors to come together: high mobilisation and wide public sympathy, strong allies on the inside, a constructive media and perhaps a crisis of some description to weaken the defences of the vested interests blocking decisive action. How does this bode for the People’s Climate March? Overall, quite well. In terms of size, the march itself appears to be well co-ordinated: events are autonomously planned in more than 2,500 locations (compared to 600 in 2003). There are multiple agents in multiple cities and countries, with a clear message that is being communicated effectively via social media. It may beat the 2003 record set by the anti-war demos – but social movements are unpredictable entities. In terms of beauty, organisers are committed to non-violence and peaceful demonstration, which is a good start. If the media focus on the festival rather than the fringes, even better. Secondly, to be a success, the march should be adding its weight to some strong “internal” actors and institutions with similar ideas who can take things forward more consistently – what is sometimes called an “advocacy coalition”. The coalition is probably growing. The scientific community started it of course, and pressure groups and some politicians have taken it up. But businesses have begun to come on side as the opportunities for energy transition and new industries become apparent. The march may be part of a coalition, but to be part of a winning one, it has to match – and eventually overcome – opponents to change. And there are still strong opponents and almost intractable problems in organising collective actions as states wait for others to take the lead. On the other hand, for some, the global fossil fuels industry is showing signs of a crisis of sorts, as record investments have failed to bring commensurate new supplies on stream. This could be the right kind of crisis, if renewables keep falling in price and utilities are left floundering – although another financial crisis triggered by a carbon bubble bursting probably won’t help much. In any case, urgency dictates that now is probably the best time to try to make headway. However, the biggest problem in predicting success is perhaps that it is not clear what “winning” really would look like. Climate change is such a wicked problem, that it shouldn’t really be considered as a single problem at all. Dealing with climate change means addressing numerous different goals and dilemmas, not all of which can be solved at the same time. Preventing more than two degrees of global average warming acts as a rough proxy, but for some this is too much and averages miss the point anyway. But that should not worry the marchers on Sunday unduly. Their job is primarily to push the question, garner salience and apply pressure. And to enjoy themselves. Olaf Corry does not work for, consult to, own shares in or receive funding from any company or organisation that would benefit from this article, and has no relevant affiliations.